"Is It Necessary to Go to Mass During Vacation?" 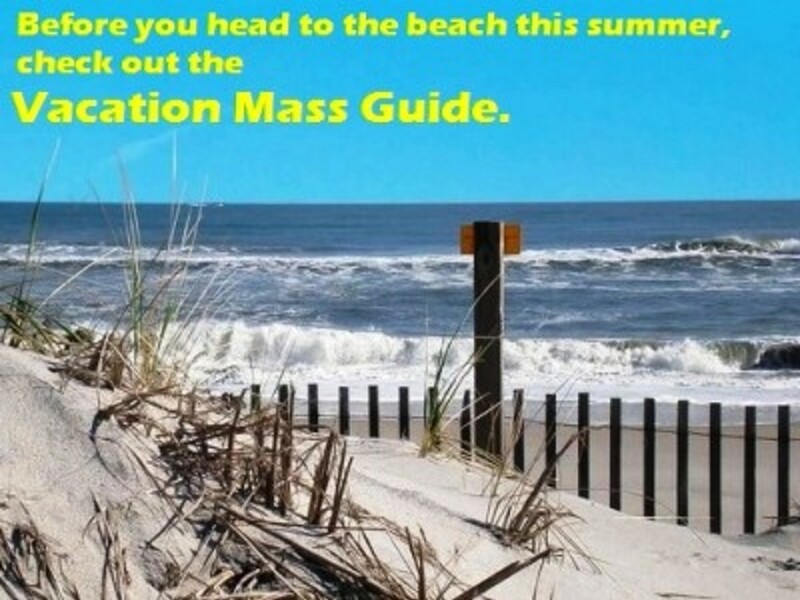 "Is It Necessary to Go to Mass During Vacation?" This is summer time and vacations abound. It's a time to rest, relax, and get away from the everyday pressures of life. Vacations can help us unwind and empty out. Some folks are content to empty themselves into a good book, others go camping, fishing, golfing, sight-seeing, and some go visiting family. We all take time to refuel. Have you ever been on a vacation that required another vacation to rest from the vacation you just finished? And let's not forget how expensive vacations can be. Vacation is defined as "freedom from obligations, leisure, and release." Vacation is sometimes called a holiday (holy day). Holy in Hebrew is "kiddushin," literally, "set apart". When we go on vacation, do we pack the Commandments or leave them at home on the dresser? Do we plan for Mass in our itineraries? Or do we sometimes feel like we need a ''vacation from God” and think that finding a church is a hassle? Here’s a different question: Did Jesus ever go on a vacation? Mary and Joseph annually took the Child to Jerusalem to celebrate the Passover in the Great Temple. This was a costly journey for this working-class family. Nazareth to Jerusalem was about a five-day walk over ninety miles of rough country. The sun would beat down on the caravan by day and the nights would be unpredictable. They would visit relatives, see new sites, shop in a busy market place with countless vendors, and, of course, visit the Temple, all while enjoying the culture, the music, the food, and whatever else this holy and massive city offered. Why bother going to Mass? We’re on vacation! Some intellectuals say, "If the homilies were better, I would go to Mass." The teens tell me all the time, “Mass is boring.” Why are teens so quick to say Mass is boring? What are their expectations? Constant entertainment? My response to that is if you want a good laugh listen to Obama sing "Amazing Grace." We come to Mass to worship God because it is our duty and salvation. Can you imagine the number of dull sermons Jesus of Nazareth must have heard over thirty-three years? Or the conversations He had with His parents after a day at the synagogue? Yet, He faithfully kept HOLY the Sabbath day. "I don't go to church because there are so many hypocrites there." Do you really think there were no such hypocrites around during the days of Jesus' public worship? He openly challenged hypocrites to change. The Church is not a museum of saints but rather a hospital for the sick…and since I have become a priest, I feel like I am constantly in the emergency room! And I love it! I love being a priest! Boring homilies and hypocrites notwithstanding, the Nazarene was obliged to keep Holy the Sabbath day. Since Christ tithed, went to synagogue, honored and respected His parents, and of course kept all the Father’s commandments, so, of course, should you and I. Furthermore, the Scriptures tell us that Jesus invested much of His time in private prayer as well. It was a given that every Jewish family would have a schedule of daily private prayer. This would be particularly true at meals. As the Last Supper indicates, Jesus continued this custom to the end. Yet, He put aside quality time for private prayer--not the few minutes left at the end of the day or the desperate prayer of “faith” when we lose our keys so we are not late for the movies. Luke’s Gospel tells us, "Crowds pressed on Him. But He retired to a mountain and prayed." In Mark we read, "In the morning, He got up, left the house, and went off to a lonely place, and prayed there." Ralph Stockman, in Cor ad Cor Loquitor [Heart Speaks to Heart], says, "To pray is to expose the shore of the mind to the incoming tide of God." One must thereby conclude that Jesus considered prayer a necessity. The Scriptures warn us that the servant is not greater than the master and the pupil not greater than the teacher. Jesus gives us yet another example of right living and a right relationship with God. Why then do we assign prayer to the fringes of our busy lives? And why are our lives so busy? What are we doing that is so important? And is what we are doing more important than keeping God’s Commandments? Vacations are good and sometimes necessary, but no matter how hard we try, we can never, ever vacation from God.